This post includes a summary of a study published in the British Medical Journal 2003 Oct 4;327(7418):777-82 and a recipe for pinchos morunos. Dietary fat intake and risk of stroke in male US healthcare professionals: 14 year prospective cohort study. He K, Merchant A, Rimm EB, Rosner BA, Stampfer MJ, Willett WC, Ascherio A. The objective of thestudy was to examine the association between intake of total fat, specific types of fat, and cholesterol and risk of stroke in men. The study consisted of 43,732 men aged 40-75 years who were free from cardiovascular diseases and diabetes and were followed for 14 years. The study found that fat intake was associated with a 9 per cent reduction in stroke risk and that cholesterol, red meats, high fat dairy products, nuts, and eggs were also not related to risk of stroke. Using a mortar and pestle, grind the seeds and place into a large bowl. Into the large bowl, add the oregano, paprika, garlic, some salt & pepper, and combine with the liquids. Goopy. Cut the pork into cubes and toss to coat in the bowl. Once coated, let it marinate somewhere cool and sanitary for at least 2 hours. Soak wooden skewers in water during this time. 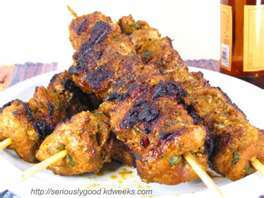 Thread meat on skewers and place on ripping-hot grill for about 6 min a side. Eat hot on the stick. We had ours with grilled asparagus.